The research tells us that in the United States the structure of a typical math lesson has two main parts. The first part generally consists of the teacher using multiple examples which are then followed by the second part, some form of independent practice. Quite often an observer will see some form of homework review and Q&A at the beginning of class. Although this structure can be seen in almost 95% of the classrooms in the United States, you would be hard-pressed to find it anywhere else, especially in the countries who have high achievement rates in mathematics. In these countries, most of the class time is spent on discovering procedures, developing algorithms, and exploring ways to solve problems before the teacher demonstrates a solution. In Singapore, all teachers are trained at the same school, the National Institute of Education which is an autonomous institute of Nanyang Technological University. 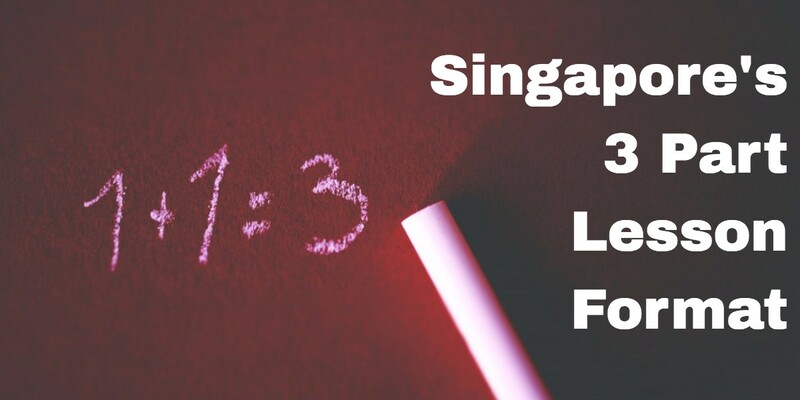 They are all taught to use the same general approach to teaching a mathematics lesson, the “3 Part Lesson.” The 3 part lesson was actually not developed in Singapore, it originated in Japan and was adopted by Singapore and the NIE as one of the most effective ways to structure and deliver mathematics instruction. If you were to visit any classroom in Singapore you will most likely recognize it immediately. One of the many benefits of having only one school to train teachers is that all teachers receive the same high-quality training. I’ll offer a brief summary of each part of the 3 Part Lesson, and I’ll dig a little deeper in subsequent articles. 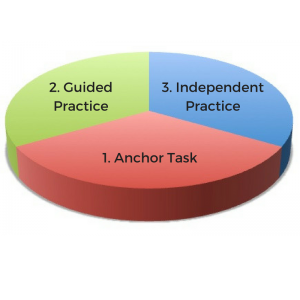 The Anchor Task is a carefully chosen problem or another type of activity that is presented to students. The teacher spends a significant amount of time, say at least 10 or 15 minutes, engaging students in the task. This part of the lesson most certainly involves exploration, reasoning, collaboration and appropriate struggle. This task is chosen or created so that it is accessible for all students in the class, and so that it can also be extended to enrich the experience of the more advanced learners in the classroom. Once the students have completed the Anchor Task the teacher will usually review the problem with the class. He or she will use probing questions and other strategies to deepen the students’ understanding and consolidate their learning. Essentially it is time to clarify, refine, extend and document. Once the anchor task is complete, and the teacher has framed the learning with the students, he or she will move into guided practice. Students practice what they have just learned with support to ensure correct understanding and procedure. This support can take many forms, all with the goal of consolidation, deeper understanding and creating a more durable recall. Instant feedback to ensure misconceptions aren’t permitted to find their way into long-term memory is a necessary component of course. This is also a good time for teachers to work with students in small groups for remediation and enrichment. When students are ready to work without support they can practice independently. This can take place in the class or at home. Independent practice also extends learning, deepens understanding and increases retention. Independent practice can take place at school or at home. It is not necessary to change a student’s location to make practice effective. However, if students are not ready to practice at home incorrect understanding cannot be corrected and families can grow frustrated with the need to support their child when it should be the teacher who is preparing the student to practice independently. Whether you’re currently developing this structure or have already begun to implement it in your classroom, it is important to understand that it is not a simple as it may seem. In each of the three parts of the lesson, there are many essentials necessary to be successful. So please continue your learning! I will write future posts that will dig a little deeper into each part of the lesson. Copyright ©2019 Dr. Bill Tozzo • All Rights Reserved.